A while ago there was a meme making the rounds which I did my very best to avoid. As my track record with memes had already deteriorated considerably by that point, the fact that I dropped the ball probably didn’t raise many eyebrows, but still I felt quite guilty. You see, I wanted to participate, but I couldn’t bring myself to because doing so would have forced me to air some unpleasant truths about the way I cook that I simply wasn’t ready to admit. I had great fun reading everyone else’s culinary confessions, though, and swore that someday I would air at least a few of mine, when the time was right. Luckily for you, dear readers, my mini-confessional last time has made me throw caution to the wind, and for better or for worse I have decided to let loose today one of my deepest, darkest secrets. So, here goes. My name is Melissa and I am quite possibly the laziest cook alive. Okay, okay, I know what you’re thinking – there’s no way I’m really the laziest cook alive, and you’re probably right. What I might be, however, is the laziest person alive who a) spends nearly every waking hour thinking about food, b) claims to prefer cooking to just about any other activity, and c) disparages those celebrity chefs who have made a fortune developing recipes and techniques for other lazy people. My shelves are full of cookbooks that encourage, cajole and admonish me to blend my own mayonnaise, grind my own spices, and roll my own pasta. I know curry paste from a mortar is more delicious than that from a can, and that stock simmered from a fresh, free-range bird will beat the pants off those abysmal cubes. I also know that melting chocolate and cooking custard directly over a flame is literally like playing with fire, but somehow in the heat of the moment all that wisdom is blasted to smithereens by the allure of time-saving shortcuts. Call me a closet sloth, or simply a lazy person in denial, but the sad fact of the matter is that when flavor and convenience are forced to battle head to head for my allegiance (and particularly when there’s something good on TV), no amount of shame, guilt or rationalization will ever compel me to willingly choose the hard way to cook. Every once in a while, though, the universe takes pity on me and sends a recipe my way that doesn’t force me to make that choice. A recipe like this, one that offers the perfect balance of taste and efficiency, is the equivalent of a straight flush in the kitchen – it’s elusive, tremendously valuable and really should be milked for all it’s worth. I stumbled upon such a recipe a few weeks ago, a preparation for quinces that first had me skeptical, but then got me so excited I couldn’t think of anything else until I tried it. Now, those of you who have cooked with quinces know that they’re normally a big-effort item: they’re hard as moon rocks, require the potential sacrifice of digits to peel and core, yet have to be cooked well in order to be edible. For most quince-lovers this effort/outcome ratio may be acceptable; for a person as lazy as me, however, it has resulted in far less quince consumption than I would have liked throughout my life. There was, of course, that membrillo last year which was based on what seemed to me then like a nearly effortless preparation, but when I discovered I could buy it cheaply nearby even that recipe seemed like entirely too much bother. This recipe, though, makes that one look like brain surgery. Not only is it so simple a two-year-old could do it, but for the complete lack of effort required the result is quinces in not just one but two utterly delicious forms. The idea comes from one of the UK’s hottest names at the moment, Skye Gyngell, chef at the Petersham Nurseries Café and the food editor for British Vogue. Skye not only has a new book out which is simply gorgeous, she has also started writing for the Independent, which is where her recent piece on quinces was published. This brilliant recipe (if it can even be called that) consists of washing a number of quinces, placing them in a baking dish with some water and sugar, covering it tightly with foil, and then going and relaxing in front of the television for approximately three hours. Actually, you could use that time for anything you want – Christmas shopping, blog-browsing, soaking in a hot bubble bath – the point is it’s completely up to you, but whatever you do, when your timer dings you will not only have the most luscious softly-yielding braised quinces to eat in any way you like, but also a fragrant ruby syrup Skye terms ‘quince cordial’, which when topped with a splash of prosecco or champagne, will easily be the hit of your next party. At which, by the way, when confronted with raves you hopefully won’t admit to your guests just how easy it was to make. You see, that’s the thing about laziness – it’s perfectly harmless as long as no one finds out. First heat the oven to 160C/325F. Wash and pat dry the quinces. You can halve them if they’re particularly large, but you can also leave them whole. Place in a baking tray and pour the water on top and sprinkle over the sugar and lemon zest. Cover the tray tightly with aluminium foil and roast in the oven for around three hours. You will know it’s ready when the quinces are completely soft and the cooking syrup is a deep ruby-pink – leave them in the oven a bit longer if necessary. Take the tray out of the oven, remove the cooked fruit and strain the syrup into a jug or jar. Allow to cool completely before using. Both will keep well in the fridge for at least a couple of weeks. 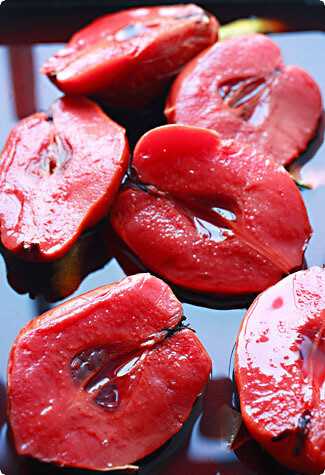 To eat the braised quinces, simply remove the papery peel and cut the soft fruit from the core. You can use the fruit in many dessert recipes that call for poached quince, or you can enjoy it on its own with a little yogurt and honey, or some vanilla ice cream. 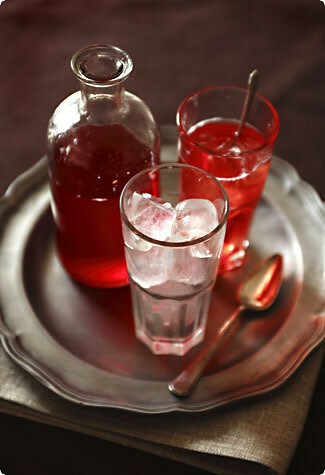 The cordial is delicious combined to taste with chilled champagne or prosecco, or if you’re going the non-alcoholic route, simply some sparkling water and ice.